This week students from Writhlington and Mendip Studio Schools hosted a visit from a group of educationalists and scientists from Malaysia. The group are investigating ways to apply lessons from the Writhlington School Orchid Project in Malaysian schools. 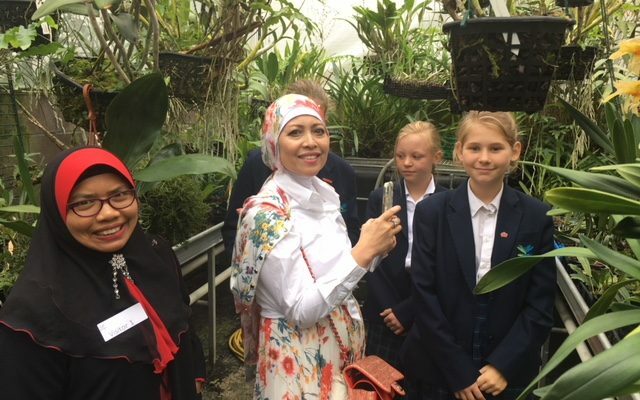 The Malaysian delegation including Dr Ratna Roshida Ab Razak, Dr Tuan Noriati, and Tengku Auvaroza were keen to find out about the Orchid Project, the impact it has on students and how it is used both in the curriculum, as a vehicle for research, and as a conservation enterprise. They hope to apply lessons from the Writhlington School Orchid Project in Malaysian schools. During the visit students from year 7 to year 13 were able to share both their knowledge of orchids and their experiences of the orchid project. Teacher Simon Pugh-Jones MBE expects the visit to be the start of a long and fruitful collaboration with the schools’ partners in Malaysia and a real opportunity for young people in both communities to learn from each other and make a real difference for the future. The public will have an opportunity to tour the Orchid Project facilities and find out about the student’s work at the British Orchid Show which will be hosted at the school on the 3rd and 4th November this year.